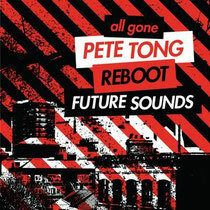 Fresh from their respective seasons in Ibiza, Pete Tong and Reboot join forces on All Gone Pete Tong & Reboot - Future Sounds. Boasting an unreleased track from Reboot and a further compilation exclusive in the form of Tong & Rogers’ ‘Listen Up feat. Meggy’, the two disc mix includes tracks from Hot Natured, Alt-J, Eats Everything, Tensnake, Nic Fanciulli & Rolando, Steve Rachmad and many more. Over the course of an Ibiza season, All Gone’s line-ups were more diverse than ever before with underground acts like Jamie Jones, Seth Troxler and Laurent Garnier, contrasting sharply with in-demand big hitters like Axwell and Calvin Harris. Reboot meanwhile was one of the stars of the Vagabundos parties, even headlining one of the nights while Luciano was otherwise engaged. This is the first time these two DJs have collaborated on a musical venture and further establishes the role of Tong’s All Gone projects in supporting the best in up-and-coming and established talent. As you might expect, Tong’s mix embraces an extensive range of music, from the low-slung funk of PBR Streetgang’s ‘Mutoscope’ to the retro, 909-heavy throb of Tensnake’s brand new single ‘Mainline’. Also included is Hot Natured’s ‘Benediction’ feat. Ali Love, a record that was huge for Pete at Pacha this season and is surely one of the most eagerly-anticipated releases of the year. Reboot digs deep into his exhaustive collection of underground house and techno, with Mark Henning’s ‘You’re Digging Into Me’ rubbing shoulders with legendary Dutch techno pioneer Steve Rachmad’s ‘Bling It Up!’ Reboot also includes a brand new and exclusive track of his own, ‘Who Stole my Stradivari’ to complete the mix. This autumn, Pete Tong takes All Gone on the road with a wide-ranging tour that includes five dates in the UK followed by ten dates in North America, including parties in San Francisco, Las Vegas, Vancouver and Miami. The album’s out November 19 on ITH.